Welcome Thursday and the approaching weekend! Happy Easter! I will be celebrating with friends and family with a dinner I will start preparing this afternoon! I will also enjoy time with friends and family at one of several Easter Services at my church! How are you celebrating? I missed posting Tuesday and Wednesday this week. What can I say…..life took over! I usually have a week of posts ready to go ahead of time, not this week! I try hard to start my weeks off relaxed and calm! This week I started with a nice Palm Sunday church service, then Monday happened and my calm, smooth train turned into a speeding locomotive! Nothing earth shattering happened, just life busyness! The message in these times is to “Hang On and Enjoy the Ride, Bumps and All!” We can’t allow life to hide our peace and calm, we just have to go with it. Ok enough sharing about my week, on with my Spring Table! I did a simple table this year! I used items I had with a few small parts added. I started with the candles and the sunflowers and went from there! 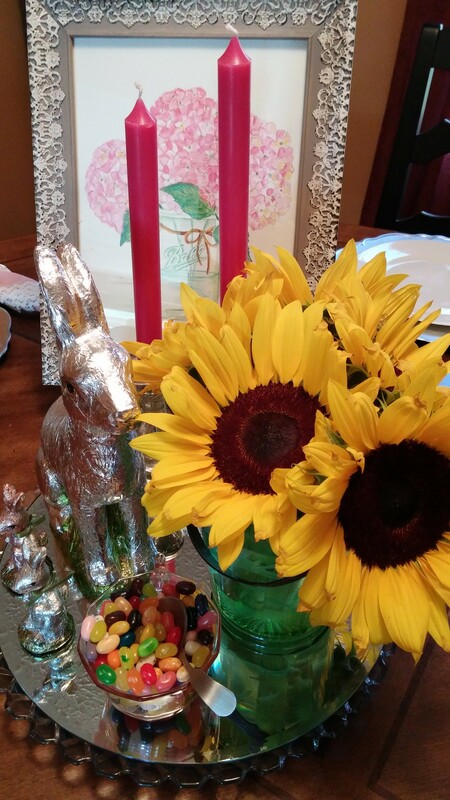 The beautiful sunflowers are in a depression glass ice bucket. I discovered this little gem at my favorite section at an antique store I like to frequent. 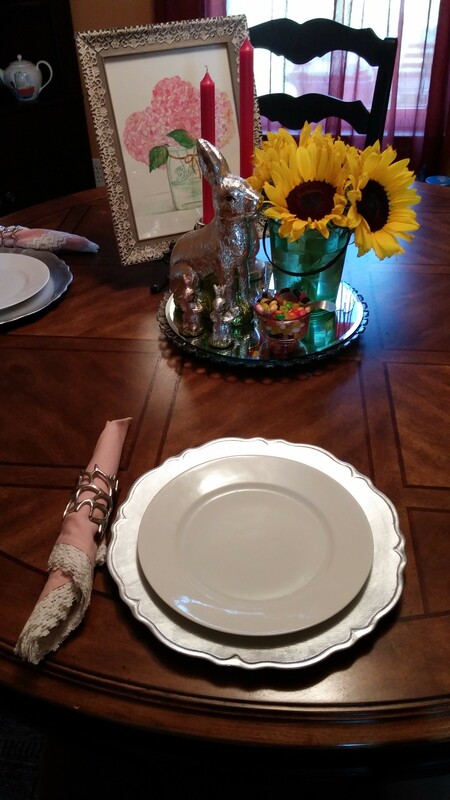 I added my bunnies for Easter, jelly beans and the place setting is just an inexpensive silver charger (found at Home Goods awhile back) with one of my great grandmother’s antique white plates. The napkin ring is a silver branch and the pink napkin with lace trim adds the perfect Spring touch. Both of those found at Pier One. The pictures do not do the place setting justice! The entire tablescape is sitting on an antique tray that was my aunts with a simple round mirror on top. The beautiful Hydrangea painting done for me by my wonderfully generous, kind friend Mary, pulls it all together! I will share more about the Hydrangea painting in a later post. 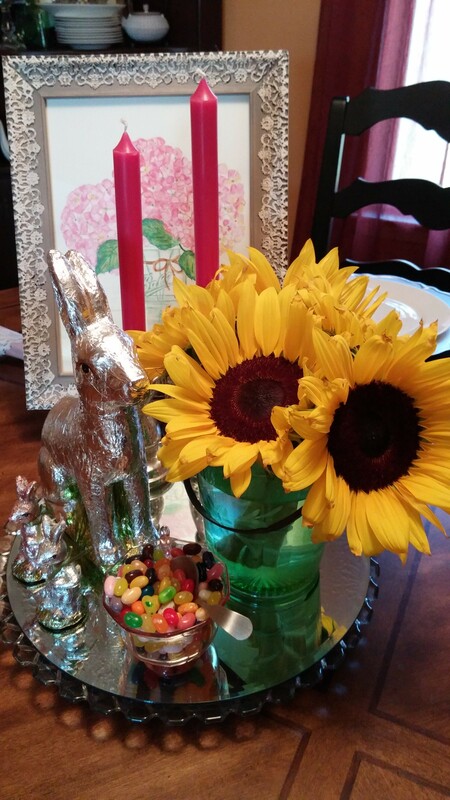 What kind of Spring decorations have you created in your home? ENJOY! Take time out for the peace and calm, it is there even on the wildest of days! I will see you back here on Tuesday, I have a delicious new recipe for you!